"Success in science depends on objective skepticism. Caution, if not reticence, has its merits. However, in a case such as ice sheet instability and sea level rise, there is a danger in excessive caution. We may rue reticence, if it serves to lock in future disasters." --James Hansen, retired NASA scientist, on "Scientific Reticence"
Join your friends for fun and games, and lots of learning: local and sustainable approaches to food production, protection of marine life, renewable energy, resource conservation, development and more. Stay late for a community potluck (from 6 to 10 pm). Also, on Friday night (the 4th) from 6 to 9 there will be a special storytelling event at the Grange Hall moderated by Susan Klein. Click the image above to see the full poster. Tuesday, Sept. 17, 5:30 pm, Edgartown. Wednesday, Sept. 25, 5:00 pm at the Chilmark Library. Patrick Williams gives a talk on powerful storms, erosion and climate change effects on the Vineyard. For more info, call (508) 645-3360. 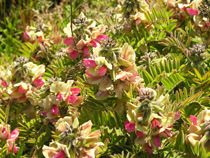 Attendees may find themselves collecting seed of Goat's Rue, Tephrosia virginiana. Saturday, Sept. 28, 10:00 am to 2:00 pm, West Tisbury. The second annual VHN potluck picnic and native plant exchange is at the Hoft Farm Field Station off Lambert's Cove Rd. Features a seed collecting workshop. RSVP via email or at (508) 693-6287 ext.10. This is a streamlined, super-easy approximation of the classic Italian dish. 90% as good, 30% the work. A baguette or other long, skinny bread for slicing. If you haven't already, try the Orange Peel Bakery -- find their bread at Cronig's, or visit them in Aquinnah. Preheat oven to 450 F and set a rack in the top position. Slice the bread on a slight diagonal, about 1/2 inch thick. Dice the tomatoes, crush or dice the garlic, and snip the basil into thin strips. Gently mix these with the vinegar and the tablespoon of olive oil in a bowl. Place the bread oil-side-down on a baking sheet and bake for 5 minutes or until just browned. Flip them over (oil-side-up) onto a serving dish, top with the tomato mixture, and serve immediately before they get soggy! 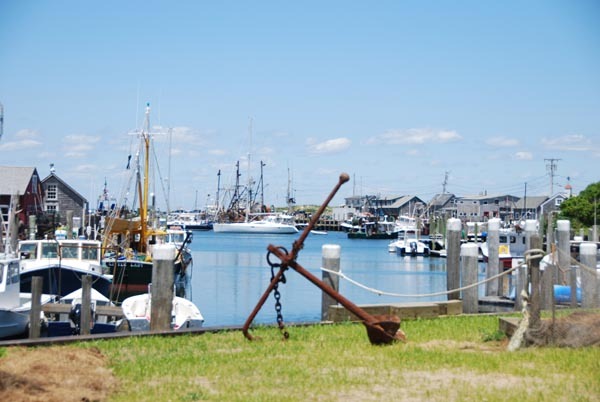 In support of their ongoing coverage of coastal erosion and shoreline change on the Vineyard, a front-page story in this week’s Gazette draws the focus a little more narrowly on the impacts of sea level rise due to climate change. Borrowing extensively from the sea level rise portion of our new report on climate change impacts on our island, as well as quotes from author and VCS staffer Jeremy Houser, the story is a nice introduction to the science behind sea level rise and what more we can expect in coming decades. The sea level rise information referenced in the Gazette story can be easily viewed online here. However, we recommended visiting the Climate Change page of our website. There you can download the original high-res version (which looks much better when printed), as well as other sections of the larger report which will be posted over the next few weeks. Part 1 is especially important as an introduction, as it defines some of the terms and sources used throughout the rest of the report. And of course, if you haven't seen it yet, make sure to check out the Gazette's very impressive special feature on coastal erosion. The effect of different levels of greenhouse gas emissions on sea level rise becomes especially pronounced later this century. The curves labeled A1FI and B1 (corresponding to the high and low emissions scenarios used in this report) represent a summary of results from studies conducted since the IPCC’s 2007 report (depicted in the AR4 bars). The VCS educational display submitted for the M.V. Agricultural Society’s annual fair continued this year’s focus on rising seas and climate change. 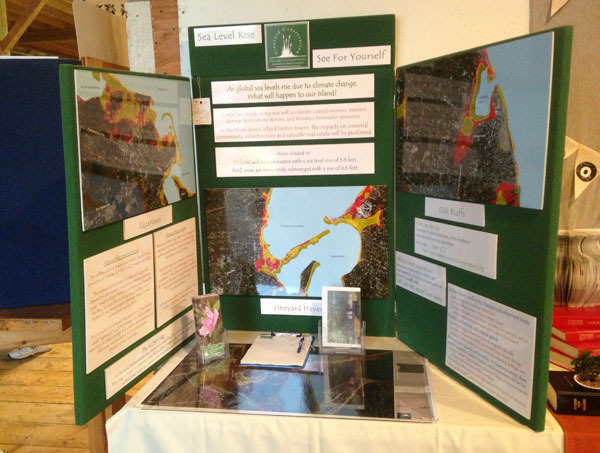 With its three large, striking maps depicting which areas of the down-Island harbor towns are projected to be underwater due to our rising seas, the display made quite an impression, winning a special award from Tisbury Waterways, Inc. Thanks to all who came out to support the Ag Society, and we hope to see everyone at this fall’s Living Local Harvest Fest! To view or learn more about the maps used in this display, visit the VCS Climate Change page. The old Parsonage House in West Tisbury, thought to be the second-oldest on the Vineyard, is going up for auction this month. VCS has always taken an interest in historic preservation to go along with our core environmental mission, but the potential sale of the Parsonage hits especially close to home. As VCS holds conservation restrictions on two abutting properties, we are greatly hopeful that the historic home will be saved, and that the new owners will be cognizant of conservation values in their future use of this centrally-located and highly visible property. Mixed feelings emerged while reading this piece in the Washington Post on SkyTruth, an ambitious project to monitor pollution – and the polluters. One thing was certain, though: it’s a fascinating story, and this will most likely be tremendously important to the future of environmental activism. Maybe in a world where the eagle-eye of Google Earth is available to everyone with an internet connection, and NSA analysts have the ability (technologically, if not legally) to oversee all private communications, we can, in the service of ferreting out environmental pillagers, ignore SkyTruth’s more big-brotherly aspects. But, let's just keep the focus more on documenting mountaintop-removal mining and disproving the false reports from oil companies during spills, and not so much in the tracking of individual fishing boats, ok?